New: The Canadian Trails at a Glance – This two-page snapshot overview of the Scout Section introduces parents and new Scouters to the adventures that happen on the Canadian Trails! 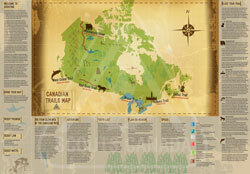 It covers everything from the uniform to The Canadian Trails map, and includes links to tonnes of great resources. Scouts is the third Section of The Canadian Path, designed for youth ages 11 to 14. Scouts has a rich tradition—it was the first Section developed by Lord Baden-Powell over 100 years ago. SCOUTING IS still about helping clever youth with pluck succeed in life by learning and practising valuable skills. Youth of Scouts age come together in small groups called Patrols. Patrols are usually made up of about six youth. Patrols join together to form a Scout Troop. Scouts want adventure! They want to experience new and exciting things such as snowshoeing, canoeing, camping and hiking. The symbolic framework of the Scout program uses the diversity found in our great country as a basis for a variety of adventures. Scouts are inspired to discover more about the world and themselves by reflecting on the historical trails that are found throughout Canada. 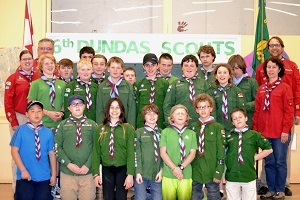 Scouts are supported in this great Canadian journey by Scouters, who act as mentors for the youth. Scouters encourage and engage Scouts in the “game of Scouting” through the Four Elements and the Scout Method. Toward the end of the Scouting journey, youth can undertake the Chief Scout’s Award to demonstrate their personal progression and development in Outdoor Adventure Skills and make a contribution to the global community.